Darren had started his career in non-League football with Malvern Town before moving to Nuneaton Borough, where he came to the notice of some League sides. In the summer of 1993, Huddersfield Town paid a £55,000 fee for the aggressive midfielder, who quickly became the fans favourite. 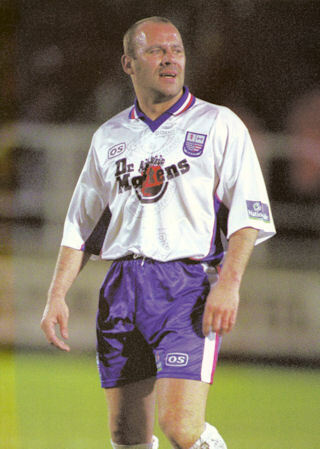 He played a total of 154 games for the Terriers, before a £400,000 move to Swindon Town in February 1997. After two seasons, he joined Bury for £200,000, and it was from Bury that Darren arrived at Nene Park on 24 March for a one month loan period. He played four times for the club before returning to Bury. A further loan period followed at Sheffield United the following year, before he was released, joining Worcester City. In March 2002, he was sacked by the club following a disciplinary hearing after being sent off at Stafford Rangers for elbowing another player. Darren recently returned to the game, playing for Midland Combination side Archadales 73 during the 2008/2009 season, before taking up the managers position at the end of the season. He left on 4 October 2010 to become player/assistant manager at the club where he started his career, Midland Football Alliance club Malvern Town. No record of his involvement with the game has been found between 2012 and 2018.